The Serraj government has vowed its support for the freedom of foreign meda representatves operating n Libya (Photo: Social Media). The Faiez Serraj Presidency Council and Government of National Accord (PC/GNA) met today with accredited foreign media representative in Tripoli and vowed to facilitate their work in Libya. The meeting included Serraj’s Media Advisor Hassan Al-Huni, his personal spokesperson Mohamed El-Sallak and the Media Head of the Serraj Interior Ministry. A number of issues impeding foreign media operations in western Libya as well as ways to mitigate them were discussed. The Serraj PC/GNA vowed to facilitate the work of foreign media in achieving accuracy and establishing the facts in reporting stories. The Interior Ministry Media Head stated that his Minister of Interior Fathi Bashagha has issued instructions to all its Ministry to ease and facilitate the work of foreign media in western Libya. He called for cooperation between the media departments of all the Serraj Ministries and foreign media representatives to better establish facts and accuracy in reporting – away from ambiguity and misinformation. While these PC/GNA statements supportive of the media are welcomed, it is unclear how effective they will be out in the field. For example, it is not at all clear, on the one hand, how far this message trickles down and resonates with the rank and file members of the regular Serraj-controlled police and army. On the other hand, Serraj’s control-and-command of the various militias aligned to him and that prop-up his administration are even more difficult to influence when it’s comes to dealing with the media. It must also be recalled that after over four decades of dictatorial rule under Qaddafi, there is also a lack of a culture in Libya of dealing with and accepting the role of independent, investigative and critical media. Independent media is often feared and conveniently demonized in Libya and portrayed as the fundamental cause of Libya’s disunity and political polarization. This phobia and demonization of the media, for example, extends to the Serraj administration which has regularly failed to respond to basic fact-checking enquiries by this newspaper. This meeting by the Serraj-led PC/GNA with the media comes on the back of a similar statement supporting the media by Serraj’s personal spokesperson Mohamed El-Sallak in January 2019. Sallak stressed that the Serraj government had taken “the necessary measures to prevent the reoccurance” of any media harassment or suppression. Serraj’s Interior Minister, Fathi Bashagha, had also met with El-Sallak in January at the Interior’s Tripoli headquarters where they discussed the “importance of overcoming the difficulties and obstacles that prevent media professionals from performing their duties and work”. Bashagha had stressed his keenness to respect the rights and safety of media professionals and journalists and to hold accountable all those who violate the law. These January 2019 meetings and pronouncements had in turn come in reaction to three events in 2018. 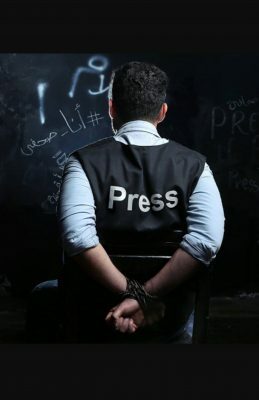 Firstly, the arrest of foreign media representatives by Serraj-aligned militias in July 2018. Secondly, the announcement of a raft of foreign media restrictive measures by the Foreign Media Department (FMD) of Serraj’s Foreign Ministry in August 2018, and thirdly a condemnation of these FMD measures by tge NGOs RSF and LCFP in August 2018. The international press freedom NGO, Reporters Without Borders (RSF) and the Libyan Centre for Freedom of Press (LCFP) had in August 2018 urged Sarraj to ‘‘intervene immediately to rescind all measures obstructing the work of international journalists and the Libyan correspondents of foreign media outlets’’. In an open letter addressed to Serraj, the two NGOs had said that ‘‘in a communiqué dated 3 August 2018, the Libyan foreign ministry’s Foreign Media Department (FMD) unveiled an unprecedented series of new measures that create further obstacles to the work of international journalists and the Libyan correspondents of foreign media outlets. RSF and LCFP had expressed ‘‘their utmost concern about the constantly escalating restrictions that are making journalistic work almost impossible. The FMD limits journalists to covering events in which it is a participant and obstructs the work of those who do not comply with its demands, using accreditation as blackmail to force international news agencies to stop employing some of their correspondents. All journalists agree that working in Tripoli now constitutes an almost insurmountable challenge that threatens both their physical and their judicial security. It will be recalled that on 31 July four Libya-based Reuters and AFP journalists/photographers were held for over ten hours by a Presidency Council / Government of National Accord-aligned militia whilst covering a story on illegal migration at Tripoli’s Bu Sitta Naval base. The journalists/photographers had been invited by the Serraj-led Presidency Council / Government of National Accord to cover the event. The incident raised fears amongst Libya-based media on how they would be able to cover any forthcoming Libyan referendum or elections in such circumstances. The FMD had also launched a quarterly prize for the “best performing” media/journalists operating in Libya. There are fears that this is a process by which the Tripoli-based government is attempting to restrict or control the media operating within Tripoli.